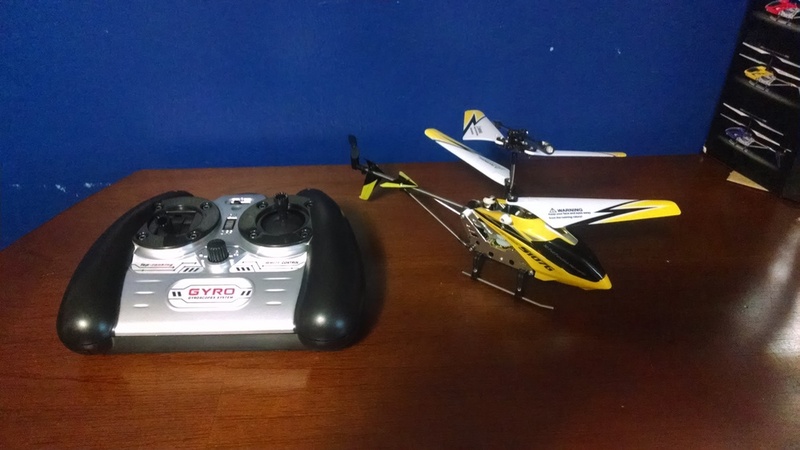 I've wanted a remote control helicopter since I was a little kid. There was this cool old guy my family knew who had big, gas-powered RC vehicles (boats, hovercrafts, and planes). I never got to see him drive them but I did get to see his work bench where he built them and I though that was the neatest thing in the world. I remember going to the dollar store and spending my allowance on a helicopter that you held in one hand and pulled a string in the other and it would shoot up twenty feet and slowly copter it's way back down. It broke after two times. Fast forward to present day. Every so often I'll look wistfully at an RC truck or plane or something at the store and pass it by, knowing I don't have the money for that hobby. Until about a month ago, when I stumbled across this video. I watched it and I said HOLY CRAP I WANT TO DO THAT. I mean, what's not to love? It basically combines photography, virtual piloting, and RC. I looked into the hobby a little bit and everyone said "if you want to get started flying RC helicopters, quadcopters, planes, etc, you should get a cheap one to practice with first." It was on $17 on Amazon and let's face it. I'm a grown man with an income. I can sacrifice $17 to live a childhood dream. I've been playing with it the last couple of weeks and it's basically everything I'd ever dreamed. With the snow I've only gotten the chance to fly it indoors. It's harder to learn than I expected and, despite ordering extra props for when the originals break, I haven't busted it yet. It lasts a little less than 10 minutes on a charged battery which makes it perfect for indoor playing. Once it dies I just plug it in and get back to writing. I plan on moving up to this guy next, but I might wait until the weather warms up. Eventually I want to work my way up to one of the big one that I can attach a camera to. Yes, that says Aerial Drone. And no, you won't be safe anywhere.